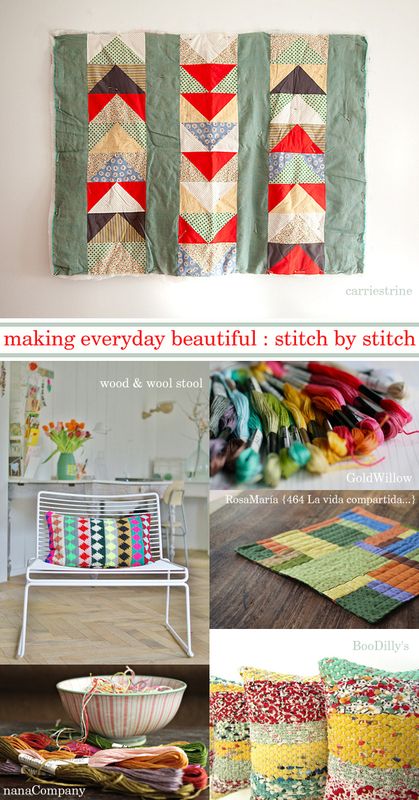 It seems everyone has found their crafting groove over at 'making everyday beautiful' with the start of the New Year. These lovely examples are just a tiny taste of my favourites this week, but I am especially smitten with Carrie Strine's Little Goose quilt piece. Her colour choices and arrangement in this quilt are just beautiful, although I must say her work never fails to inspire me! Which is just what I need right now, a wee bit of motivational inspiration! Although I've been working on some lovely custom pieces this month I'm feeling a bit 'bleugh' about the new ideas I was tinkering with before the holidays. With the iffy start to the New Year I seem to have lost my thread, my train of thought and that fizzy excitement I had for them. I think I need to lock myself in my studio for a few hours without distraction and see if I can find my fizz again. No doubt it will be buried under a pile of yarn or magazines somewhere!? Emma, I predict that you'll be fizzing again very soon. Do look at nature. There's always so much inspiration there, no matter which season. Oh, and also do look and touch some yarns...that always starts some imagining. Book yourself a flight over to Australia and visit our sunshine for a Huge Hit of Fizz - I'm sure it would be just the tonic, Emma! !